Foxy Flowers is a glass-on-glass mosaic of over 800 pieces of hand cut glass. The top flower is a towering foxglove, followed by three purple iris and then a spray of white daisies. The daisy flowers have golden glass globs in the centre giving the flowers a more 3D affect. 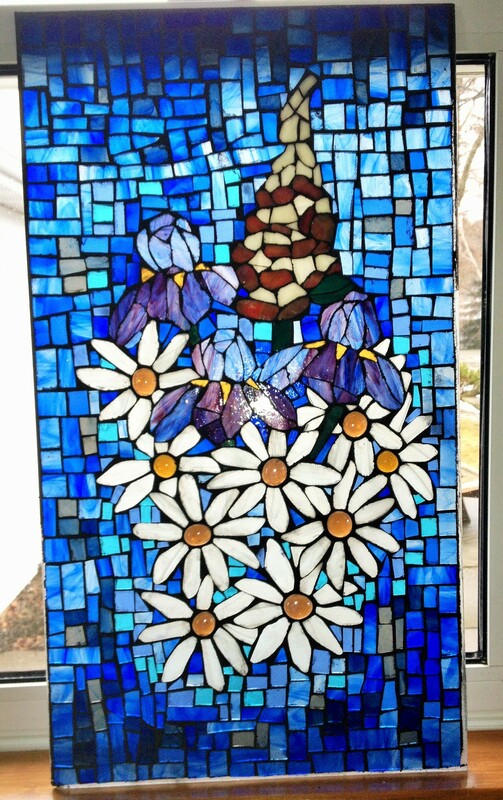 This 12″ x 24″ glass-on-glass panel is ready to be framed and inserted into a fence, door, or hung in front of a window. It has over 800 pieces of hand cut glass secured to a base of tempered glass, grouted and sealed three times before the final coat of wax. It has a cream/brown foxglove, three purple iris and white daisy flowers. The daisy flowers have golden globes for the centre giving them a more 3D look. The background is made of various shades of blue and competes for attention almost as much as the flowers. This is one of my favourite pieces and the detail is just like a beautiful bouquet of flowers.